Canadian IndyCar driver Robert Wickens was airlifted to a hospital and was being treated for injuries to his lower extremities, right arm and spine following an accident early in a race in Pennsylvania Sunday. IndyCar said Wickens, 29, sustained a pulmonary contusion. A release from IndyCar said Wickens was scheduled to undergo surgery Monday evening for a spinal injury after an MRI at Lehigh Valley Hospital Cedar Crest in Allentown "was instrumental in revealing the most appropriate surgical course." 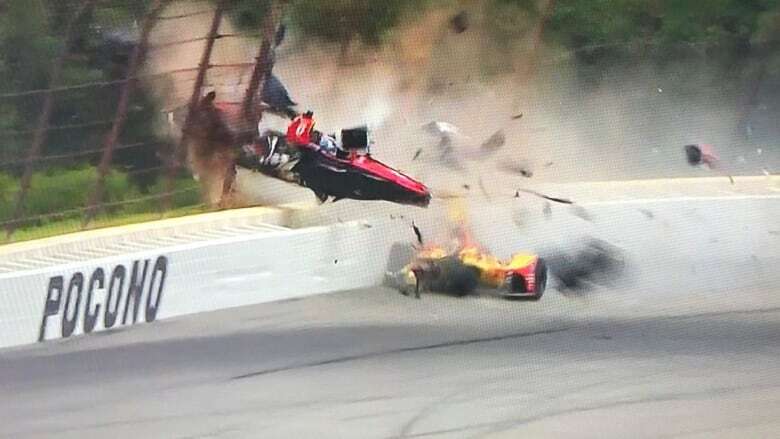 The driver from Guelph, Ont., was attempting to pass Ryan Hunter-Reay during the ABC Supply 500 at Pocono Raceway in Long Pond when the two cars slightly touched. That caused Hunter-Reay's car to careen into the wall, and Wickens's car was pulled along for the ride. Wickens launched over Hunter-Reay's car and sailed into the catchfence, where the tub of his IndyCar spun several times before crashing back onto the track. Medical workers at the Pocono Raceway calmly attended to Wickens, who was taken to an ambulance before he was transported to a helicopter. The impact of the wreck tore out a large section of fencing. Curt Cavin, the vice-president of communications for IndyCar, said on the TV broadcast that Wickens was "awake and alert" as he was being transported. IndyCar Cavin: Wickens, awake and alert being taken to Lehigh Valley. Canadian James Hinchcliffe and Takuma Sato were among the other drivers involved in the wreck. Hinchcliffe, of Oakville, Ont., seemed to be in pain, grabbing his wrists as he slowly left his car. Hinchcliffe was cleared and released from the medical centre. "I took my hands off the wheel when I went backward, and I think some piece of debris came in as I was holding [my hands] in, kind of just smacked the top of them, so I took a bit of a beating, but nothing is broken, just some swelling and some cuts. We'll rest it up and be fine," said Hinchcliffe. The race was delayed nearly two hours and only eight laps in the 500-mile (about 805-kilometre) race had been completed because of Wickens's crash and another accident right before the start. We can only hope one thing, that Robbie, Hinch and everyone involved is ok. These are the dangers we face, but we always hate to see it. The start can be debated for years, but doesn’t matter right now, focus on the well being of our friends and competitors. Pocono Raceway president Ben May said about 24 metres of fence and a few posts were damaged in the wreck. The Pocono staff needed about two hours to repair the track and make it safe for the rest of the race. Hinchcliffe is a teammate of Wickens on the all-Canadian team. The two raced each other as youngsters in Toronto and Hinchcliffe, runner-up on ABC's Dancing With The Stars in 2017, helped lure Wickens to IndyCar this season after a successful career in Europe. Briton Justin Wilson died from a head injury in 2015 when a piece of debris from a crashed car bounced off the track at Pocono Raceway and hit his helmet. Alexander Rossi won Monday's race, but his thoughts were with Wickens. "It's tough to really celebrate after what happened," Rossi told reporters.